The World Economic Forum is best known for its Annual Meeting in Davos-Klosters. What is it about? The 48th World Economic Forum Annual Meeting aims to rededicate leaders from all walks of life to developing a shared narrative to improve the state of the world. It is Jan 23-26th, 2018. 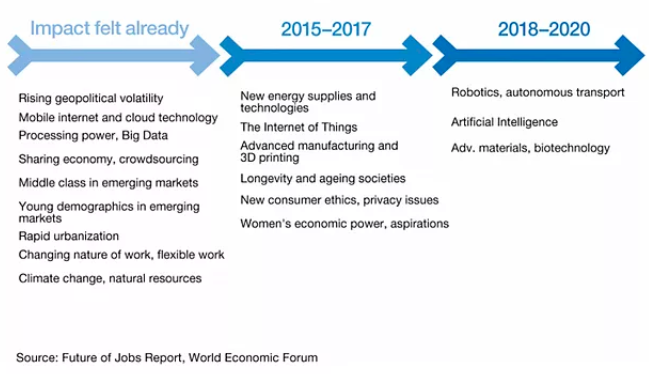 The Fourth Industrial Revolution is building on the Third, the digital revolution that has been occurring since the middle of the last century. The real difference in the previous revolutions and this one is that the Fourth is evolving at an exponential rather than a linear pace. It is disrupting almost every industry in every country. The shift from simple digitization (the Third Industrial Revolution) to innovation based on combinations of technologies (the Fourth Industrial Revolution) is forcing companies to reexamine the way they do business. As a result, business leaders and senior executives need to understand their changing environment, challenge the assumptions of their operating teams, and relentlessly and continuously innovate. 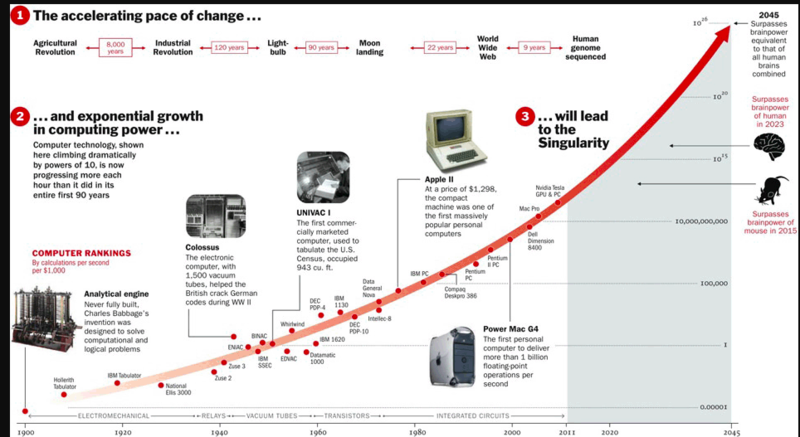 If we have been operating in linear world, then we might be caught off-guard by the level of exponential changes. In a linear world, for instance, walking 30 meters, you end up 30 meters away. 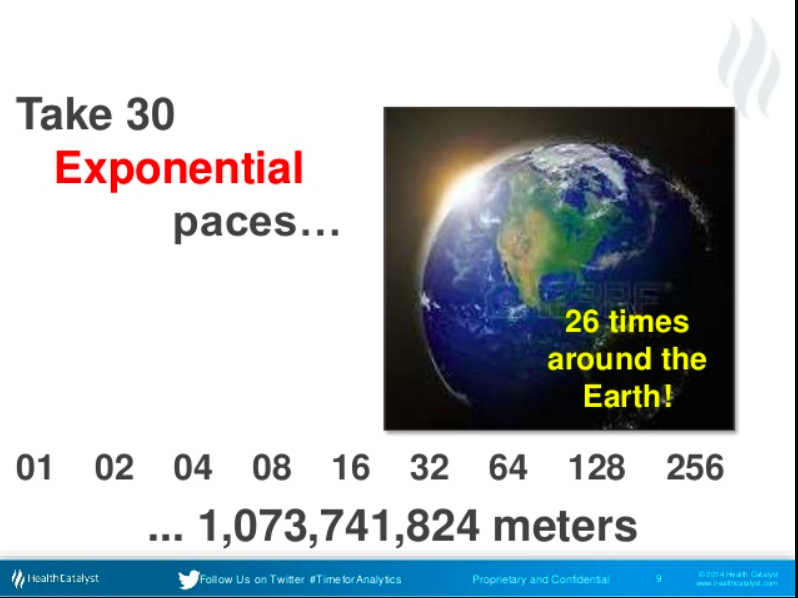 But in an exponential world, if you take 30 exponential paces, you end up 1,073,741,824 meters away. Businesses need to prepare for the Fourth Industrial Revolution’s rapid pace of change and broad impacts to preserve the interest of the consumers and the public at large while continuing to support innovation and technological development. It’s easy to get caught off-guard. In our grandpa’s world, it was linear. Things changed on one side of the world and no one knew about it. Today, things change instantaneously. To do this, we must develop a comprehensive and globally shared view of how technology is affecting our lives and reshaping our economic, social, cultural, and human environments. Never has there been a time of greater promise, or one of greater potential peril. But today’s decision-makers are often trapped in traditional, linear thinking, or too absorbed by the multiple crises demanding their attention, to think strategically about the forces of disruption and innovation shaping our future. The people who have gained the most from it are consumers who are able to afford and access digital technology which has made possible new products and services that increase the efficiency and pleasure of our personal lives. These could be things like ordering a cab, booking a flight, buying a product, making a payment, listening to music, watching a film, or playing a game. It is possible that the technological innovation will also lead to a supply-side miracle, with long-term gains in efficiency and productivity. The result of this is that transportation and communication costs could drop, logistics and global supply chains may become more effective, and the cost of trade may diminish. All of these things can open new markets and drive economic growth. At the same time, as economists Erik Brynjolfsson and Andrew McAfee have pointed out, the revolution could yield greater inequality, particularly in its potential to disrupt labor markets. If automation substitutes for labor across the entire economy, the net displacement of workers by machines might exacerbate the gap between returns to capital and returns to labor. Although, it is also possible that the displacement of workers by technology will, in as a whole, result in a net increase in safe and rewarding jobs. We need to shape a future that works for all of us by putting people first and empowering them. In the worse case scenario, from a pessimistic, dehumanized point of view, the Fourth Industrial Revolution may indeed have the potential to “robotize” humanity and deprive us of our heart and soul. But on the other hand, it can also lift humanity into a new collective and moral consciousness based on a shared sense of destiny. 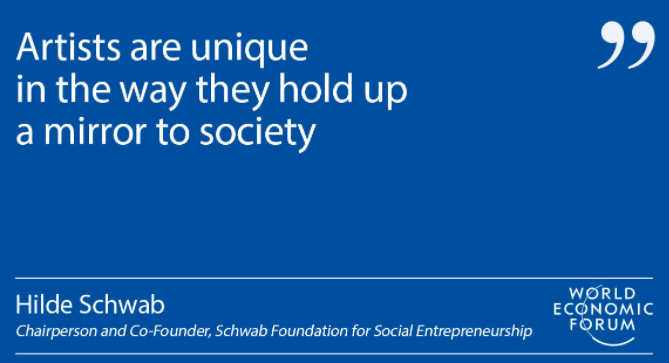 At the heart of Schwab’s analysis is the conviction that the Fourth Industrial Revolution is within the control of all of us as long as we are able to collaborate across geographies, sectors and disciplines to grasp the opportunities it presents. The time is now. Are you in? The introduction of the book is available in PDF form here. Note: Parts of this article were first published in Foreign Affairs. Youtube: YouTube channel; hit the “Subscribe” button. They will also publish in-depth interviews with Davos participants. 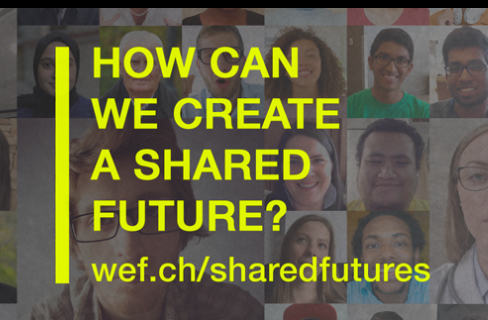 You can republish content on this feed: http://wef.ch/feed under the terms of Creative Commons Attribution-NonCommercial-NoDerivs 4.0 Unported License (“CCPL”).